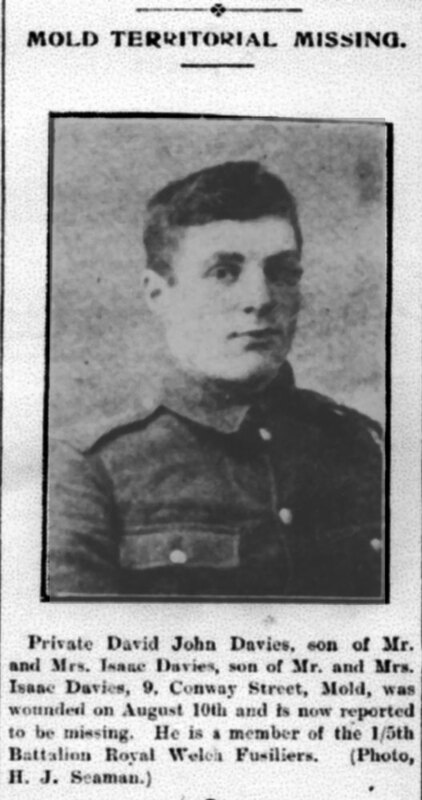 Missing in Suvla Bay 10th August 1915. He was later presumed to have been killed in action on that day. The 1911 census records the family living at 12 Garden Place in Mold. 14 year old David John was listed as a colliery labourer working on the pit bank above ground. His parents were Isaac 42 (a coal dealer) and Mary Ann 29 and he had two sisters Elizabeth Ellen 12 and Gwen John 10. The Flintshire Roll of Honour states that the family address was 9 Conway Street. UK Soldiers Who died in The Great War 1914 -19, accessible on www.ancestry.co.uk includes an entry for David John Davies. It confirms the regimental details at the top of this page and tells us that he enlisted in Mold. This source says he was killed in action in Gallipoli. There are two medal index cards for David John Davies. 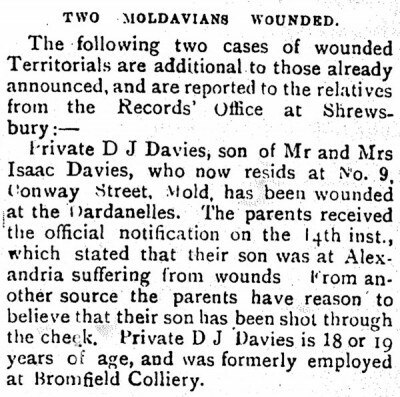 One of them refers specifically to his 1914- 1915 Star and includes a note dated 16th January 1919, that there had been an application from his Mother, Mary Ann Davies for this medal. The card says he was ‘presumed’ to have been killed on the 10th August 1915 which was 2 days after he had entered the theatre of war in the Balkans. The other card lists his other two medals. The Register of Soldiers’ Effects in which the army calculated what moneys were owed to deceased soldiers includes an entry for David John. It shows that his father isaac, received two payments totalling £5..9sh..9d. 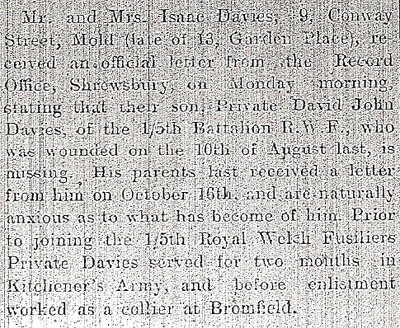 This source says that he had died on or since the 10th August 1915.